If you’re looking for a compact car that offers you the ability to choose either a sedan or a hatchback for the drive you want to make and the technology that makes a lot of sense for you, the Kia Forte could be the perfect choice. This car has been redesigned for 2019 to be a car that has the power you need and the fuel mileage you’ve been looking for during your daily commute. Consider the pros and cons of this little car when you’re ready to shop for the right model for your daily drive. Kia has created a car that offers you the qualities you want in a small size to make sure you can have the look and the style you want when you drive. The Forte is packed with impressive features that you won’t find in other models to give you the package of items that you’re looking for. Enjoy the benefits of connecting your smartphone to the infotainment system in the Forte. The cabin of the 2019 Kia Forte offers you the benefits of softer materials than you might expect. You’ll also be able to choose items that include leather upholstery, dual-zone climate controls, and more trunk space than you would ever expect. Check out the roominess in the back seat that makes it possible for you to have the space you need for your passengers when you drive. If you like the look of the Kia Optima, imagine that car shrunk down to compact car size. That’s what you’ll find in the Kia Forte that you want to drive and enjoy when it’s time to head out on the road. The front of the car offers you the trademark tiger-nose grill while the roofline arches to the rear to make it easy for you to enjoy the look of this impressive car. There’s only one engine offered for the Kia Forte which is a 2.0-liter four-cylinder model that makes 147 horsepower and 132 lb.-ft. of torque. While these numbers don’t sound like much, it’s enough to make this car one that’s active and energetic on the road. The engine is attached to a CVT to give you the smooth ride you want and the feeling of a great drive when you head out for the day. The 2019 Forte rides on new vehicle architecture that’s stiffer than the previous model of the Forte. This car now has more high-strength steel in the build and it offers the benefits of being a Top Safety Pick+ model that makes it easy for this car to be one that delivers the safety and the drive desired. There are a few different ways you can enjoy the safety and the driving experience in the Forte. We don’t expect the engine of the Kia Forte to have a low growl of a powerful sports car, but we do want to enjoy the sounds offered. The Forte brings you an engine sound that makes the drive a bit noisier than you might expect. If you can handle the engine sounds, then you’re likely to enjoy what the Forte has to offer for your drive. The seats look great, but they are flat and hard. The red and black leather looks great, but if you want seats that are positioned higher and offer you more comfort, you’ll want to look somewhere other than the Kia Forte. You might find the seats to be just fine for you, but you should certainly take the Kia Forte for a drive to see if it has the comfort you need for your daily commute. 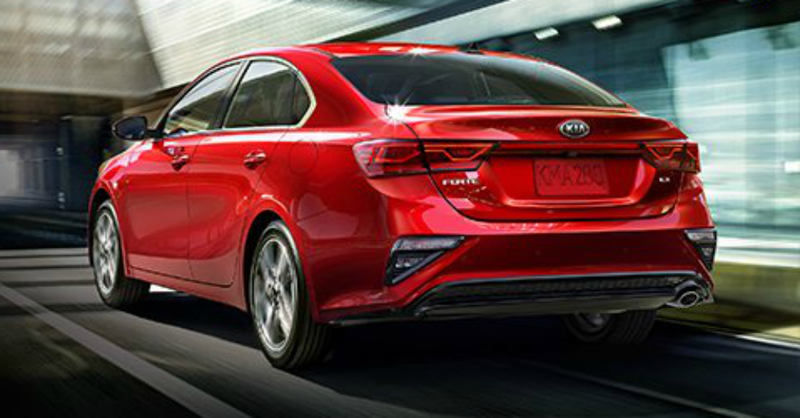 If you’re looking for a car that gives you the drive you want, is straightforward in its application of features, and gives you the ride quality that makes a lot of sense, the 2019 Kia Forte is exactly what you’re looking for. Get behind the wheel of this car and let it become the right one for you to enjoy the drive during your daily commute. Looking for something slightly different? Opt for the Kia Soul!